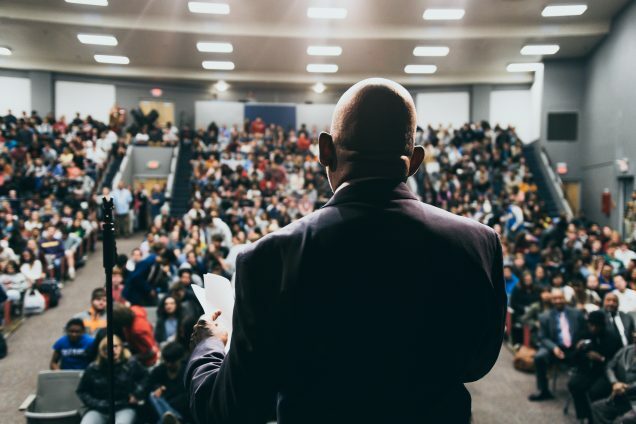 In part one of this story, Dr. William Lynn Weaver talked about the racism he faced as one of the first students to integrate West High School in Knoxville, Tennessee back in 1964. After he graduated, Lynn left Knoxville and never looked back. 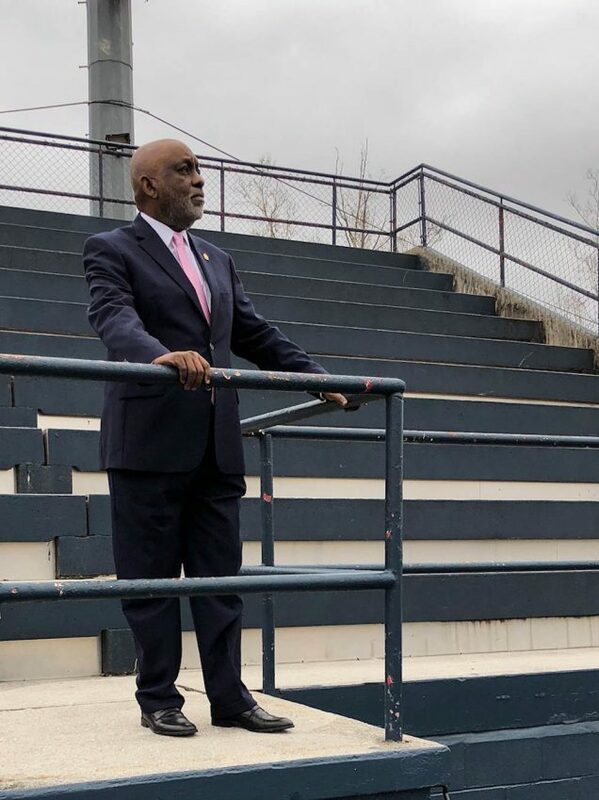 After Lynn’s StoryCorps interviews recounting his experience integrating West High School were aired on on National Public Radio, Lynn got an email from the school’s current principal inviting him back to see how West had changed in the five decades since he was a student there. In this episode of the StoryCorps podcast, we join Lynn as he makes the trip to West High School for the first time in over five decades. Middle photo: Dr. William Lynn Weaver in the stands at West High School. Photo by Jud Esty-Kendall for StoryCorps. Bottom photo: Dr. William Lynn Weaver speaks to students at West High School. Photo by Daryl Johnson. Released on December 4, 2018. Jasmyn Morris (JM): Last week, we brought you the story of William Lynn Weaver… who, in 1964, joined more than a dozen other black students in integrating West High School in Knoxville, Tennessee. William Lynn Weaver (WLW): As soon as we got into the school, the principal was calling the roll. He said, “Bill Weaver,” and I said, “My name is William.” And he said, “Oh, you’re a smart n-word.” I don’t remember a day that a teacher did not tell me that I didn’t belong. In the 50 years since I graduated, I’ve never even driven by West High School. JM: On this season of the StoryCorps podcast from NPR… we’re bringing you stories of reunions. JM: In this week’s episode, we join Lynn on his journey back to a place he thought he’d never set foot in again. I’m Jasmyn Morris. Stay with us. Without hesitating, Lynn declined her invitation. But when she got him on the phone, and told him how much his alma mater had changed, Lynn decided it was time to go see for himself. So earlier this year, he got in his car and started the drive back to West. And because Lynn always avoided those roads, he needed to use GPS to get there. Jud Esty-Kendall (JEK): What do you hope comes out of today? JM: That’s StoryCorps producer Jud Esty-Kendall. WLW: Well, for me it’s kind of to release some of that anger and bitterness that I’ve held for fifty years. JM: As Lynn stepped out of his car and into the school, he noticed how much it had changed. The Confederate flag that once loomed inside the school’s entrance was now gone. In fact, much of the building had become unrecognizable to him. Still, there were some familiar faces, family members and former classmates who joined Lynn on his journey back to West, including friend and former teammate, Fred Downs. During their first year at West, Fred stood up to a white upperclassman who was harassing him in the school auditorium. Afterwards, Fred was not only expelled but also began to receive threatening calls from the Ku Klux Klan. WLW: That’s one of the reasons why I consider you the bravest man I’ve ever known because you were a 15-year-old kid. JM: With help from the NAACP, Fred returned to West and graduated alongside Lynn in 1967. And since then, Lynn had always wanted to ask Fred a question. WLW: Why did you decide to stay at West High School? FD: I think it was my calling to stay. Regardless what the pain was, my will was stronger than theirs. I didn’t let them break me. It was just something in me that I didn’t quite understand myself. WLW: Every day that I walked through those halls I thought about leaving. All during that time, I was afraid but you were the person who showed no fear. FD: I’m just a guy that had a lot of faith. Not only did I have faith in myself, I had faith in a lot of you guys. We had this love for each other that most people wouldn’t understand and I don’t think you can really define it. WLW: It’s almost like a war zone – Who are you in the trenches with? – and that person is lifelong. FD: Yeah… we became true brothers then. You know, I’m a little slower, a little weak, a little tired. But, Lynn Weaver, I will always have your back. WLW: And I’ve just been honored to have you as a friend, Fred. So I just want to thank you. JM: And the two old friends walked the halls of West – together – for the first time in five decades. Another first came later that day when the principal welcomed Lynn into the school auditorium. WLW: This is not the West High School I attended 50 years ago. JM: Lynn stood behind a wooden podium and looked out at the student body. It was certainly more diverse than it had been in the 60’s. But diversity is just one step toward equality. So Lynn took the opportunity to challenge students and faculty to do better. WLW: I would say to you look to your left, look to your right. Somebody next to you, somebody in this auditorium is being harassed, is being excluded because of their race, their religion, their sexual orientation, or their economic status. You can change that. And I want everybody at least to think about, how can you make a difference in somebody’s life? You’re never too young to stand up, to walk out, to kneel for those who are not as well off as you are. So make West proud and make yourself proud. And as Lynn finished his speech in the school’s auditorium, something occurred to him. This was the first time he had ever stepped foot on that stage. WLW: As a student, I remember sitting in that auditorium when they announced the scholarships for students who were going to college the next year but none of the black students were called. I was not recognized. Fred Downs, who had gotten a scholarship to Knoxville College for football, was not recognized. So to stand on that stage with an auditorium full of students and teachers, to have them positively respond to me was a great feeling. Lynn also learned that the school’s foundation has started a scholarship in his name. So this spring, he’ll be back on that stage again to present the scholarship to a graduating senior. But his biggest take away wasn’t anything tangible. WLW: The lesson I learned in science was that for every action there is an equal and opposite reaction. So the reaction to hate should be love but the science doesn’t work for human beings. I always considered West High School hell and I haven’t changed – those three years were hell. I’m just glad it’s a different West High School but I don’t think you can do evil to people and expect them just to forgive; I mean, I’m not a saint. My experience at West High School taught me hate but my return to West High School taught me that, in spite of the hatred, there can be change. And that change can be one that’s loving. JM: That’s all for our two-part series. It was produced by Jud Esty-Kendall and me. Thanks to our engineer David Herman, and script editors Danielle Roth and Sylvie Lubow. Our fact-checker is Natsumi Ajisaka. We are especially grateful to Dr. William Lynn Weaver for bringing us along with him on his journey back to West High School. And thanks to the Weaver family, Fred Downs, Principal Ashley Jessie, the students and staff.